1st post btw so go easy. Pretty good value smartwatch. One of the best prices on ozbargain if I'm not mistaken. Been wearing this for about 2 weeks now and coming from a guy who has been rocking a G-Shock for the last 10 years, I really like it! Very comfortable, handy for quickly checking notifications while at work, good for keeping track of your activity levels and HR. I was a bit sceptical of wearable tech, but consider me a convert. If only the battery life was a little longer (roughly 2-3 days per charge). pal on 18/03/2019 - 17:33 Comment score below threshold (-18). Sell to me for $49? @pal: Well I think it should be doing more than a fitbit and fitbit cost more than $49. @Letrico: Did I say I never cared about that brand? That's a rip off. Just because people buy it, doesn't mean it is worth it. What is the average iq you think? joshuah on 18/03/2019 - 19:54 Comment score below threshold (2). PuppieWayne on 19/03/2019 - 06:12 Comment score below threshold (0). pal on 19/03/2019 - 12:29 Comment score below threshold (0). Rumbaar on 19/03/2019 - 08:56 Comment score below threshold (0). pal on 19/03/2019 - 12:32 Comment score below threshold (0). What's the durability like in compared to a Gshock? Hm so tempted. Been looking at smart watches for awhile and I really liked the Samsung watches design. The HN site suggests that this watch uses Android as an OS. This is incorrect - it uses Tizen which has nowhere near as many compatible apps. Just be cautious if this is important to you - I almost purchased this until I read a review that mentioned Tizen. any idea if this is the LTE or Bluetooth only version, doesnt mention on their site. thanks. i bought one, came back just to confirm it wasnt LTE. lol let it go man. Felt great never wearing one, when I finally realized too. This or the Galaxy Active? If you like the look I guess? 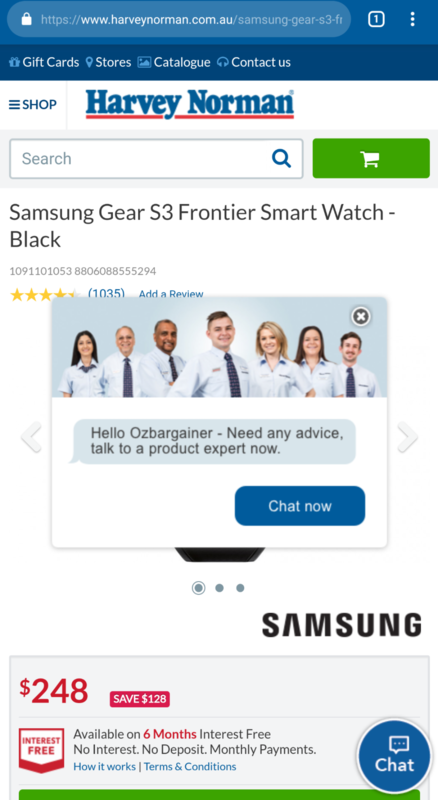 I think the S3 frontier/Galaxy watch looks more sleek. Wow, did anyone else get this pop up when you clicked through to the HN website? Yea they been doing that since last time they had massive surge of OzBargainers. Would the new Galaxy Watch Active be a better buy compared to this, if it gets a good discount during Easter? I have the gear S2 as well as this both are great watches for the price the S2 is smaller and lower profile than this one on a mans wrist , the standout feature of these watches is the turnable bezel so easy to use your apps on the watch. I've had asus zenwatch which is also a good smartwatch but these samsung one a far far better. I have used this watch everyday for just over 1 year and the heart rate and movement sensors stopped working. It may be due to the software update or something else, but I have tried all methods but sensors still dead. It worked great for 1 year. I wouldn’t buy Samsung watch again and probably switch to Apple or Garmin. I could probably live without a heart rate sensors but the movement sensors doesn’t work so the watch face cannot turn on without pressing the side button, which is rather pointless. I highly recommend to not waste your $248 and buy something else. The comment above about this worth $49 is probably true. Once the sensors stop working then your phone screen becomes a better watch than this. The newer model Galaxy watch may not have this issue however is hasn’t been out for longer than a year so it’s still a risk. Should be under 2 years warranty? yes I'm currently going through warranty claim etc. which is always an inconvenient process to the end user, no matter if it is a full replacement or not. A $300+ device 1 year ago shouldn't need to be reliant on its warranty to support its product. I'm just putting it out there for those looking to fork out $250 be aware of the potential problems in a years time. It may not affect all owners. Argh hope you get a replacement unit that will last. I guess this is again where Apple stands out you just go in there and replace ur broken unit. Samsung are dicks with their warranties in my experience with them, they cover the watch itself for two years so you should be fine, but the straps they class as accessories and only cover for 6 months. So as expected 7 months in to owning an s2. An acknowledged RMA issue in the USA with the glue coming away from the brackets that hold the strap together, I asked them to replace just the straps they said nope the straps are accessories and not part of the watch, but couldn't advise how you can wear the watch without something you deem as an accessory, telstra said speak to samsung, samsung a said speak to telstra, online samsung support said no, Samsung store said no… grabbed a magnetic one from ebay in the end and the watch apart from that has not missed a beat, but very dissapointed in the three times I have had to contact Samsung for warranty claims. Their store just seemed to be full of people angry with their service. Wish I had buy it from officeworks and not telstra as they would have replaced it on the spot. I'll add my 2c into the conversation. I've owned the watch for two years (purchased with S8) and I can say that the biggest issue with it is the lack of third party apps. There are a limited amount of additional apps and currently the only mapping app that seems to work is HERE WeGo (phone still required). Offline music for Spotify or other music streaming services is basically non existent or requires buggy work arounds and the small memory limits you to just a few playlists for running if you want high(ish) quality music. Bezel is easily knocked … I wish they had made it slightly more resistive as I keep moving it when I'm on my bike. Touchscreen is great and still works while wearing motorcycle gloves which is the main reason I purchased. I'd still rather have this than an Apple Watch. My one works great with offline spotify.have you done the new update? Can you share more about - Why not Apple Watch? Yeah but how great is the dial? thats like the only reason thats convincing me to get this over the xiaomi band 3 and the lenovo 9 hybrid smartwatch. I would definitely get it straight away when someone figures out how to put WearOS on it. Is there an alternative OS that has more 3rd party apps available? I can't seem to find clear information online. The frontier is 12 months.. although would the ACL come into effect?? Seeing its currently a retail watch of 399 (Samsung website) i would expect a number of years.. When I bought my Frontier im sure the guy at JB said 12 months warranty, trying to upsell their internal extended warranty for $45. On looking at the Samsung website it states Gear devices are 24 months.. So I feel a little bit better that it is 2 years not 1. For those that arent a fan of the limited Tizen, I'll mention I'm extremely happy with my ticwatch pro, I get the android wear ecosystem and the dual screen is great for my battery life, build and features are a step up from my old ticwatch S and I get a week easily without a charge. Bought it from officeworks not long ago at higher price. Do they give priceback like the good guys? Got the pro and I am reasonably happy with it. Got it from an Amazon sale. Coming from a Samsung S2. @cerealz: yeap, and dual layer display. @cerealz: I went swinging with the Samsung and the charging tabs underneath slowly corded away. I have not used the dial, it may be the thing, but what is wrong with the touch screen? it is very responsive.. I went swinging with the Samsung and the charging tabs underneath slowly corded away. Was there a lot of fluids present that may have had an affect on the watch? Personally, after the gear fit, I won’t be buying another Samsung wearable. Too many issues and in store support instructed to fob off warranty repair requests (including by outright lies). Not for me. My current S7….which was replaced 1x by Samsung for screen burn, battery issues and the sound frying itself…has decided, just post warranty, to duplicate the previous S7’s issues. After Samsung outright lying about warranty periods and what is covered by warranty for both the he phone and gear fit….I’m done. I like this watch so much more than my Apple watcb I used with iPhone. This and my galaxy is magic. Looks great being round like a normal watch. Its latest update has made the watch snappy and apps like WhatsApp are great now. One of the reasons I haven't gone back to Apple is this watch. Brought mine when it was released, tempted to get a backup replacement. Great watch, worn daily for number of years, still get at least 2-3 days out of it. The one question I can't seem to find a straight answer to: can the S3 Frontier do offline Spotify music, if you have a premium Spotify account? The answer to that seems to be mixed, some people say yes and others say no. That's the main feature I want, really. I want to listen to my Spotify playlists on BT headphones without having my phone with me. But I have heard all kinds of bad things about the availability of apps in Tizen. I've had mine since Nov 2017, offline Spotify has worked for me since I got it - it was the reason I got this over any other smartwatch. Basically you can just download a playlist offline, and listen to it via Bluetooth - perfect for walking/jogging and you don't need to be connected to your phone either (I usually have Bluetooth headset and turn WIFI off, offline playback works fine for me like this). The Spotify app itself isn't the best and sometimes you will need to wipe your cache data, delete the app, re-install and re-download your playlists cuz it can freeze, this has happened to me once but I was able to fix it. The reason I was so confused is that I can't see any Spotify app on the Tizen store, when I do a simple search online. So I wasn't sure if it was even a thing. But it sounds like there are other sources to get apps for the watch. Can 100% confirm, purchased the watch last night and set this up. Extremely happy about this feature, something i've been wanting/needing for a while now. Can you run and play music/podcasts from this watch if you have BT headphones? As well as tracking the run? Just bought one at OfficeWorks with price beat 5%. I bought this last week from eBay for $252. Arrived 2 days later, opened the box, got out the watch. 5 mins later got PriceHipster email saying HN had it on sale for $248.